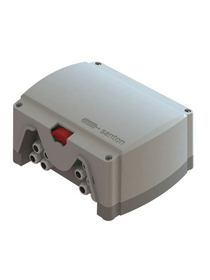 The new, improved Firefighter’s Safety Switch system from Santon is designed for automatic (remote/motorised) disconnection of the DC output from an installed array of PV modules. The Firefighter Safety Switch system can operate/disconnect a PV installation quickly, completely and remotely with one simple action at the control-panel interface, or even by remote actuation using the mobile phone network. By shutting off the installation, no DC power is conducted from the array through the property which results in a safe situation for firefighters to fight the fire and enter the building.